Yes, I'd like to know when you've written a new post! 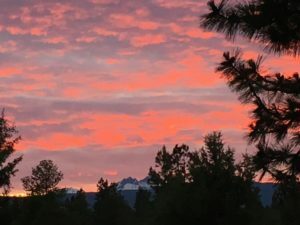 Sunset over Broken Top from our deck in Bend. Settling into the new life. We've been in Bend full time for 2-1/2 months now, and it's taken every second of that time to feel settled in. Of course, it's a work in progress, and is evolving every day. During this time I've come to realize the value of routine. Often, people complain of their lives being too routine, which they translate into boring. When routines are taken away, or left behind, one can find that life is chaotic, unsettling. It's exciting to start something new, but at the same time, I believe human beings need some sort of routine to take comfort in. To be grounded in. When that is established, I believe the creative, self-motivated person can jump off from that safe place to explore new worlds, and grow one's creative practice. Here I am at the jumping off point! I recently re-wrote my artist statement and came to using the metaphor of a stage play to describe my professional life. Looking back I could see my life divided into three phases. Act One: graphic designer, 24 years. Act Two, ceramic and mosaic artist, 10 years. With the arrival of 2016 and the decision to leave our life of 25 years in Hillsboro and settle in Bend, Act Three has opened. The new title: artist. Just one word, or two, if you like— visual artist. I'm moving into a place where I'm focusing on exploring my art for me. Setting aside pursuing commissions. Well, let's just say that my primary focus is going to be creating fine portable art that pleases me first. There may be some larger, collaborative work that I'd consider! You never know what might come along. I plan to keep open to whatever experiences and challenges present themselves.